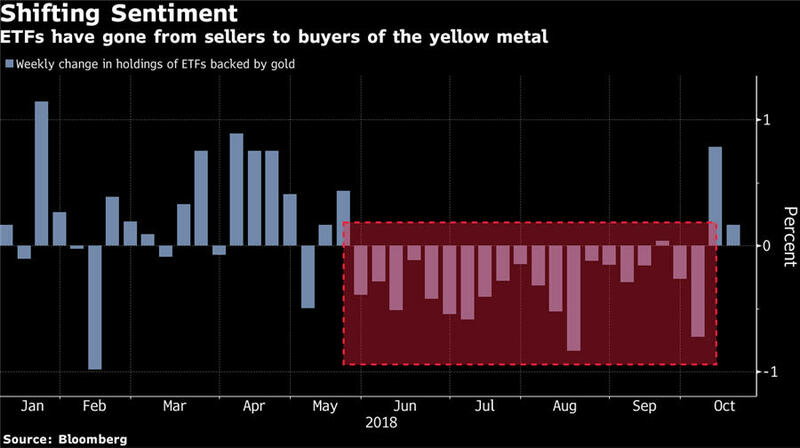 Hedge funds that doubled down on bearish gold wagers are facing a gut check.The metal is in the middle of a surprise advance, posting the fastest rally since the Brexit vote as a surge in haven demand combines with seasonal buying. 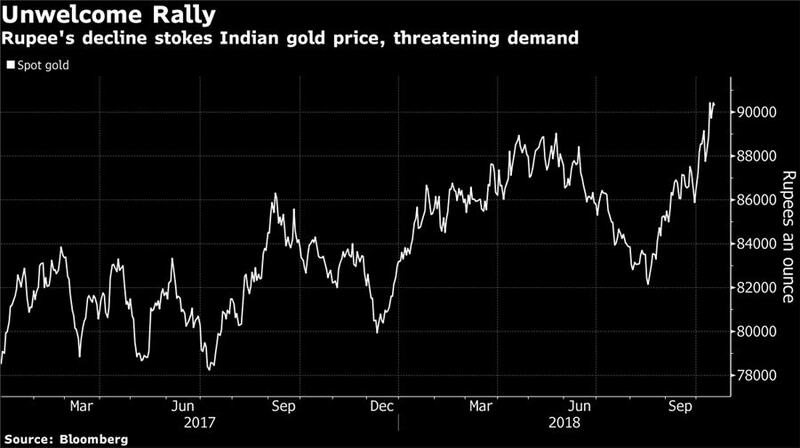 The sudden snap of its unlucky streak — bullion has declined every month since April — blindsided fast-money investors, but that could be good for gold bugs. 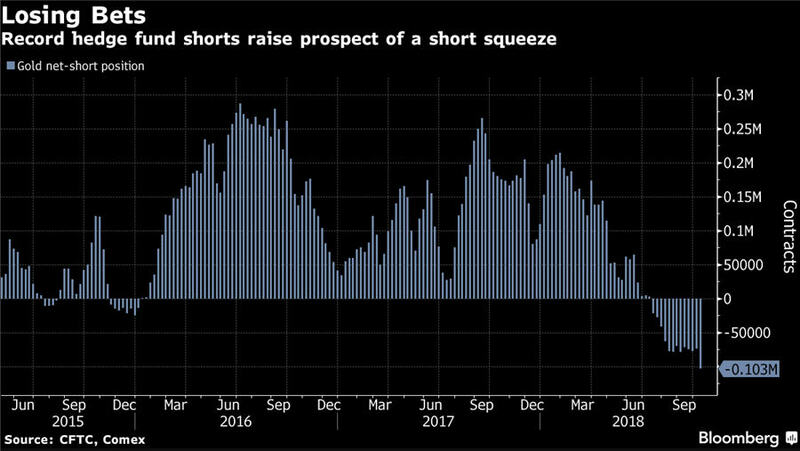 Speculators boosted their net-short position in bullion futures and options to the largest since at least 2006 in the week ended Oct. 9, according to government data released last week. That was just before gold’s biggest one-day jump since 2016. Should these shorts find themselves on the wrong-side of a lasting rally, a squeeze may fuel the advance further. The last time hedge funds were net short for an extended period, prices soared almost 10 percent as the positions unwound. The metal edged up to $1,225.94 an ounce as of 12:12 p.m. in London on Wednesday. 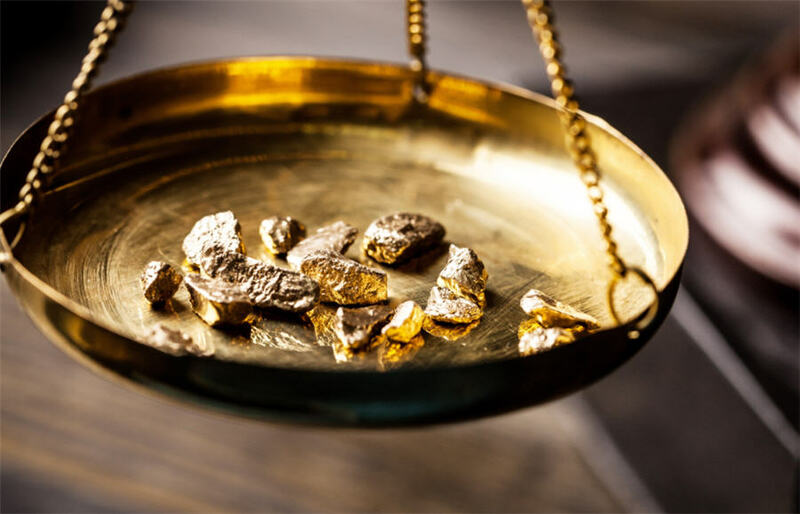 Exchange-traded funds have been a source of gold supply from May through September as investors pared their holdings amid a price slump. The tide has turned: In the last week they have added 16.4 metric tons to their assets, the most since April, according to data compiled by Bloomberg. Gold prices and fund flows are strongly correlated. In every year where holdings went up, gold has increased, and vice versa. Thursday’s 2.5 percent surge, which was the biggest jump since the U.K. voted to leave the European Union, blasted spot gold through its 50-day moving average. The momentum has continued into this week, pushing prices over the 100-day MA. For some chart watchers that’s a sign bullion could be set for further gains heading into 2019. Meanwhile the dollar’s vice-like grip on the shiny metal, which has punished prices this year, is easing. 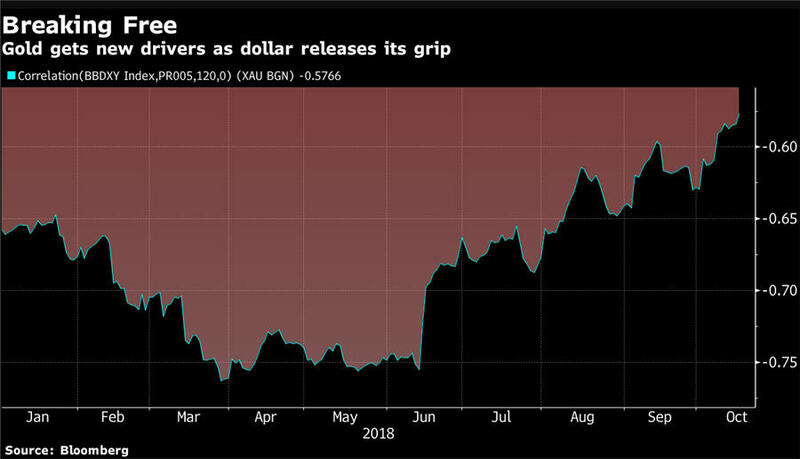 The correlation between the greenback and gold has weakened in recent months, indicating other drivers — such as haven demand from investors fleeing equities — could continue to firm up bullion. And yet, for all its attributes as a financial asset, gold is still a commodity, and therefore reliant on physical demand. And its key anchor — India — is flagging. The rupee is sliding and local prices of gold are soaring. That suggests demand from the world’s second-biggest buyer during the festival of Diwali next month may be weak for a third year running. 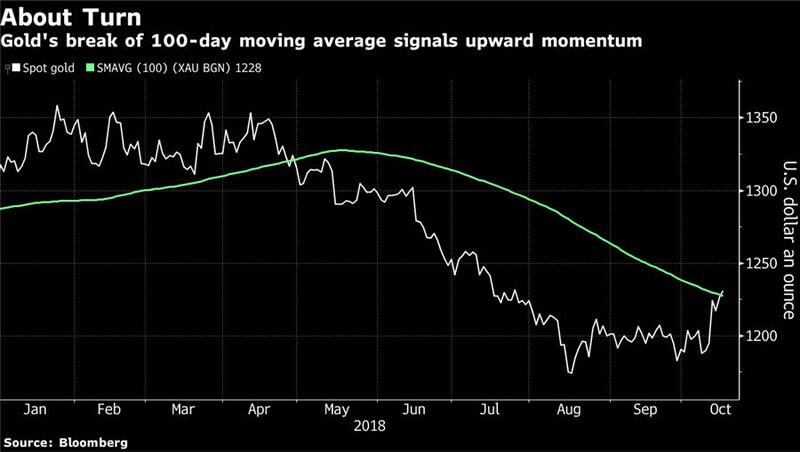 Gold's break of 100-day moving average signals upward momentum.